Education on Energy Conservation and Work Simplification techniques. What is Carpometacarpal Joint Arthritis? 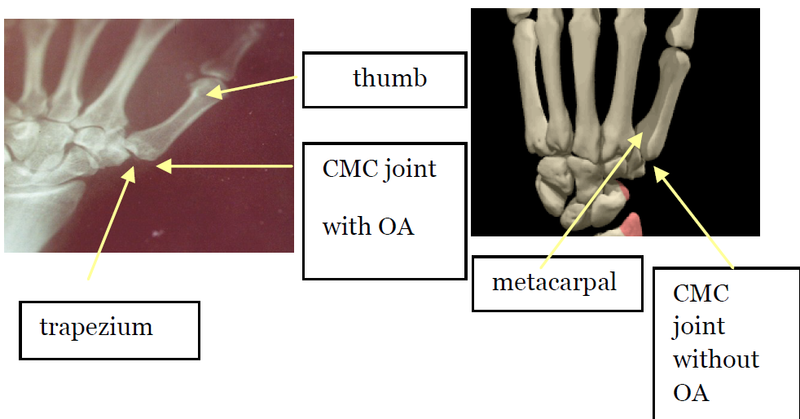 The CMC joint is the joint at the base of your thumb. It is made of two bones. These bones are your metacarpal and trapezium . The cartilage on the metacarpal and the trapezium wears down because of the Osteoarthritis. Cartilage allows the bones to move smoothly over each other when your CMC moves. When it wears down, it loses the smooth surface and the bones rub against each other and you feel pain with movement. The ligaments of the CMC joint are loose and unstable; because of this, the pressure falls unevenly with pinching / gripping activities resulting in early wear and tear of the cartilage in the area. Degenerative conditions caused by a trauma. This occurs most often with fractures. The bones and cartilage in the joint may be disrupted by the injury and begin to rub against each other and cause early wear and tear of the joint. In general, when cartilage wears down, you have pain with simple gripping and pinching tasks due to damage to the cartilage, resulting in bone on bone. 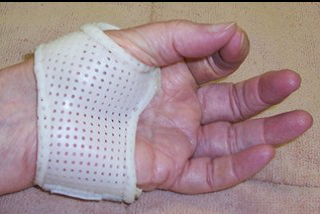 Depending on the stage of the disease, your doctor may recommend one of the following If you present to the physician at stage 1 or 2, he will refer you to a certified hand therapist to get a custom splint fabricated and learn the techniques to prevent progression of the disease. If your symptoms are severe and you are at stage 3– early 4 your doctor may offer you a cortisone shot. A max of 3 shots / year are offered. The shots may decrease the pain but it does not eliminate your problem. Thus, you would need to continue with your joint management techniques with adaptive devices and continue your splint wear etc. The shots buy you time to prepare for surgery if the symptoms return or get worse. LRTI ( the most common surgery) The trapezium, one of the small bones in the wrist, is removed. Then a wrist tendon (Palmaris longus or part of FCR) is cut and rolled into a ball. This ball is then used to fill the space where the trapezium was located. 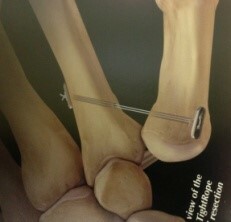 The surgeon then secures the tendon in place, occasionally a pin is used for this. Decrease swelling, pain, and scarring right after surgery. Stabilize the thumb immediately after surgery. For the first 3-4 weeks after surgery you will be in a cast to protect the thumb. Next you will be fit with a custom hand based thumb spica splint to wear for about four weeks. 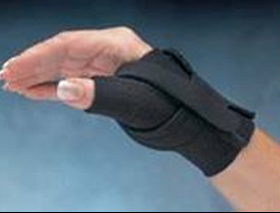 This splint will be worn at all times to provide support to the thumb and pro-tect the surgery. 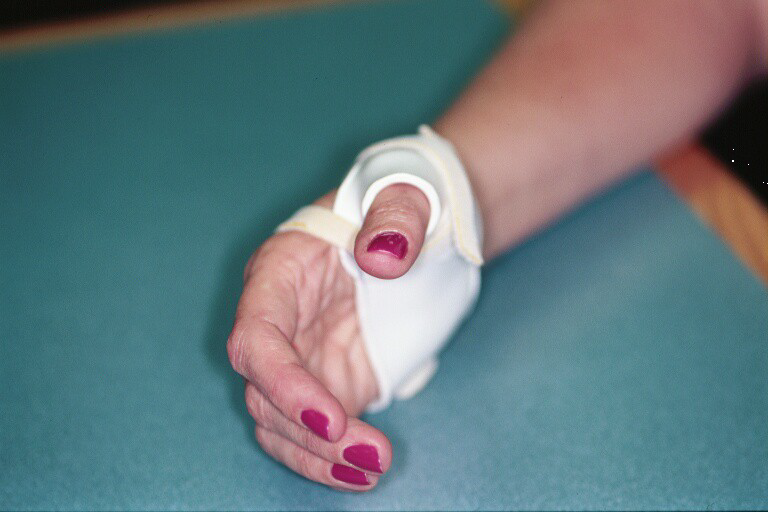 As the surgery heals, the splint can be removed for exer-cises prescribed by your therapist or doctor. Splints, are weaned off from 6 weeks to 3 months after surgery. Some people continue to wear the splint for heavy use of the hand. Therapy is normally initiated about four weeks after surgery. Time frames may vary depending on your doctor and how fast you heal. Your thumb scar following surgery will look something like the picture above; you will also have a smaller scar on your forearm. You will be taught techniques to help to control the scarring from this surgery. Use Vitamin E to massage the scar once the incisions are healed. Exercises will focus on regaining pain-free movement in your thumb and wrist joint and promoting improved fine motor coordination. You will begin with gentle active assistive motion. Resistive gripping and strengthening exercises are often not started until two months after sur-gery. Pinching is the last movement to be strengthened. This is because pinching places the greatest amount of force on the CMC joint, and you may damage the surgery if this is started too soon. Edema is swelling. Keep your hand elevated at all times until you are able to resume normal function with your hand. You will be taught specific massage techniques to manage any swelling in your thumb/hand. Keeping your hand elevated, icing regularly and performing your exercises will help reduce swelling. Often a therapy session will be initiated with a modality. The therapist may use some form of heat, such as moist heat, ultrasound, or paraffin wax to decrease pain and stiffness in your joints. 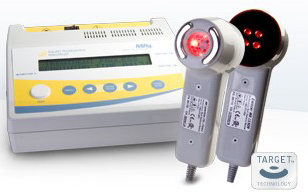 They may also offer Laser to enhance wound healing, decrease pain and swelling early in therapy. What will the final result be? The main goal of this surgery is to alleviate pain and achieve stability in your CMC joint. Many people want to rush the healing process. Just re-member, is it more important to improve stability by delaying golf for a few weeks than to have the results of this surgery last 30 years? Full range of motion and a functional level of strength should also be achieved. A functional level of strength means you can complete most tasks (opening jars, turning keys, office work, etc.) without needing help from others. Range of motion and strength should also be pain free. The recovery from this surgery can range from twelve to sixteen weeks.